1. This is the average level found averaged over all samples that were tested. If a sample had no detection, its contribution to the average is zero, even though there might be a small amount of residue present, but below the “detection limit.” The units are μg/kg (micrograms per kilogram) which is the same as part per billion (ppb). For liquids the definition is slightly different but for practical purposes equivalent. 2. The results in this table are for all groups of samples combined: domestic, imported, conventional and organic. Click on “Show Details” to see the levels broken down by group. 3. The maximum level is the highest level found in a sample. For both the average level and the maximum level, all samples — organic or conventional, domestic or imported — are included. 4. Test year is the year of the USDA PDP program’s annual report that these results were reported in. When there is more than one test year, WhatsOnMyFood displays only the most recent results. 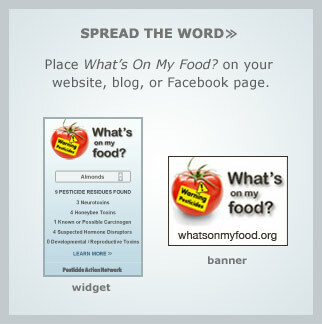 Find Out :: What's on your food?